First up is the Aesop Geranium Leaf Scrub. I’m on my second tube of this scrubbing wonder, as I am always a sucker for anything geranium. This is a bit different than your average geranium scented product though, as the geranium leaf is more subdued and does not overwhelm the scrub. It plays nicely with the bergamot and mandarin peel, completing a refreshingly aromatic triad. As for performance, I was pleasantly surprised at what a luxurious lather this produces with such little product, so the tube pictured above lasted me about 3-4 months when used twice weekly. The pumice is very fine, but does a fantastic job of exfoliating. I really can’t recommend this enough! The Immediate Moisture Facial Hydrosol is something I use almost everyday, or any day I wear my favorite power foundation, Jane Iredale’s Pure Pressed Base. As I mentioned in a previous post, I like to spritz my brush with a hydrosol after I swirl the powder on my brush, and before application. 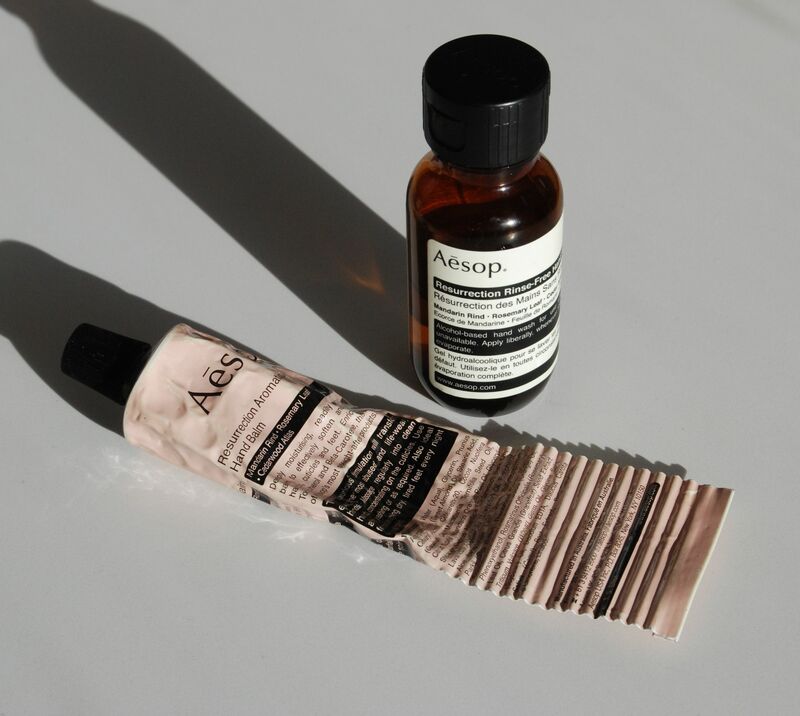 Aesop’s hydrosol gives the powder the perfect amount of moisture and makes my skin glowy rather than chalky which can happen with mineral foundation. As a pick-me-up for your skin, the Immediate Moisture Facial Hydrosol provides a hint of hydration and a nice blend of bergamot and Rosa Damascena for your olfactory pleasure. Aesop’s Parsley Seed Cleansing Mask is something I’ve been sampling over the past few months, and I finally took the plunge and bought a tube. You’ll read its many praises all over the beauty blogs, and it’s for good reason. This mask is such a treat to use. It smoothes over the skin effortlessly, probably in part to the evening primrose oil, and smells gently of lavender which I always enjoy. The scent does dissipate quickly as the mask dries, leaving you with the texture of a clay mask, but unlike other clay based masks which can feel too harsh, this one feels gentle and nurturing as it unclogs your pores. It’s perfect for those of us who have sensitive skin, but still want a hardworking clay mask. The two products pictured above are almost ready to be replaced as you can see. They are both from the Resurrection line, and I am completely in love with this scent! Mandarin orange, cedar, lavender, and rosemary comprise the Resurrection scent profile and it is heavenly. I carry a tube of the Aromatique Hand Balm and the little bottle of Rinse-Free Hand Wash in my tote everyday. The hand balm has taken me from the summer when the citrus note really shines, to the autumn due to the robust presence of cedar which is so comforting in the colder months. The balm does an amazing job of moisturizing dry skin and does not leave a greasy feeling like so many other hand creams. The Rinse-Free Hand Wash is quite similar in scent to the hand balm and is less drying than your typical hand sanitizer. I always have this at the ready and find its scent so much more pleasant than anything of its kind. I hope this roundup of my favorites has been helpful for those of you who are interested in checking out Aesop, and for those of you who already know the line, maybe you’ll discover something new. 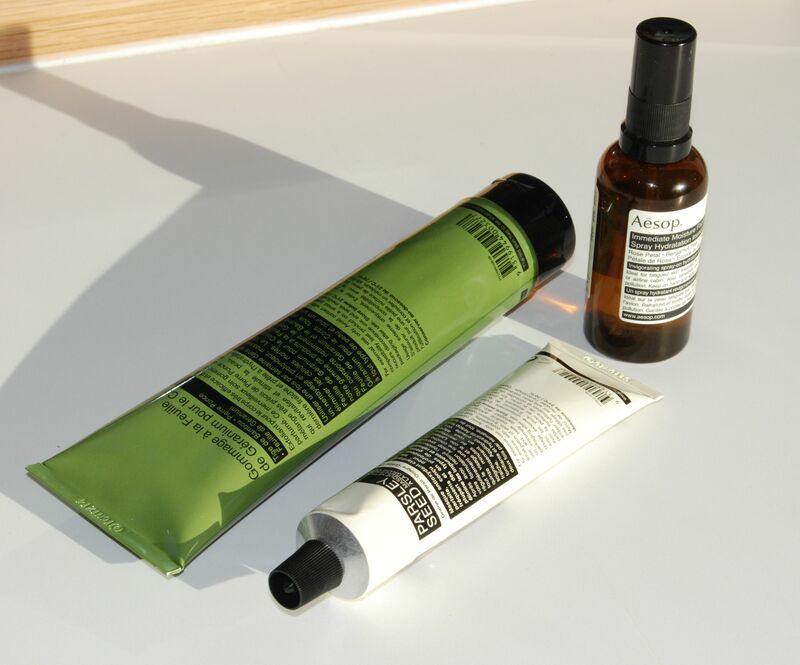 Do you have any Aesop products that you love? What are you interested in trying? Let me know! Disclosure: All items purchased by me. The opinions in this review are my own. I was not financially compensated for this review. Previous Post Bath and Body by Providence Perfume Co.